Shopping for Construction Supplies for a Tiny House? Last week, I was sharing information about Sherry’s SHE SHED. This week a customer who is building a TINY HOUSE came into shop. She had moved to the Edmonton area to help out with her aging parents. The TINY HOUSE was her solution to be close to her parents and yet have her own space. She was so happy to find new and gently used building supplies at a fraction of the cost here at Home Re-use-ables. She left the store with shingles, shutters, windows and a door. She said she would be back to shop in Refunk’d to complete the décor of her TINY HOUSE. 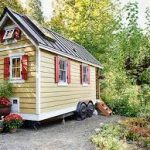 There are many ways to build and live in a home and a TINY HOUSE is one of the simplest styles.